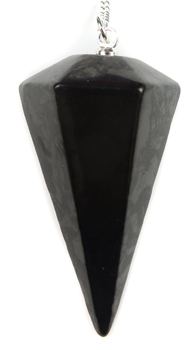 A faceted Shungite pendulum with a plain top. Comes with a velveteen pouch. This mineral is hailed as containing a healing power incomparable to any other. Shungite purifies, protects, normalizes, induces recovery and promotes growth in living organisms. Considered an excellent source of protection from harmful electromagnetic radiation.